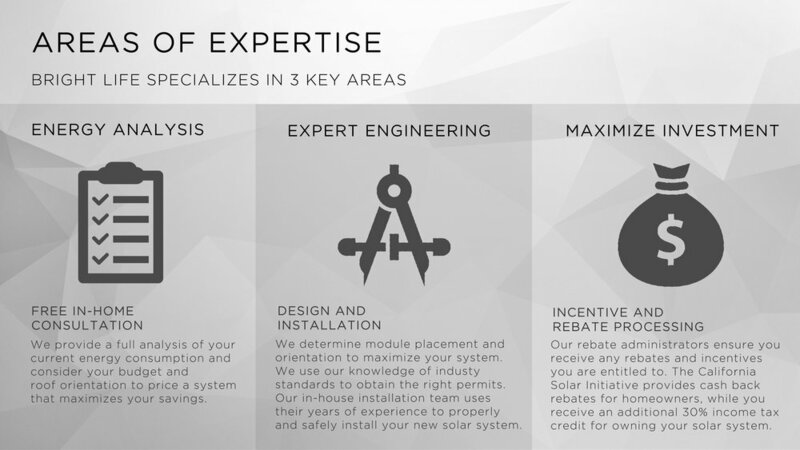 From energy analysis & design to solar system installation, Bright Life Solar has you covered. Our team will then process your California solar rebates. Bright Life Solar provides a turn-key solution to your energy needs. We handle every step of the way with an in-house team of passionate and hard working industry professionals. As a privately owned business, no job is too big or small for Bright Life Solar, and every customer will receive the care and attention they need to achieve the energy savings they desire. For more information on how you can own your solar system, check out our purchase options. For more information on the modules and inverters we sell, check out our product options. Does your business need help? - Bright Life Solar can assist you. We can provide site survey, engineering & design, permitting and installation services for your solar business, whether large or small. We provide very competitive pricing across the board and will put the time and attention into your projects as if it were our own. We pride ourselves in professionalism and are willing to help you bring your solar business to the next level. Please contact us today to discuss pricing and see if we can be of service to you. Bright Life Solar has an extensive knowledge of the solar industry and what it takes to get permits in almost any city in California. With years of experience in residential design, we can help to streamline your permitting process by providing a full set of plans including a plot plan, structural details, a single line diagram, wire size calculations and warning labels. Our designs are intended to save you money during the installation process, as well as keep your business moving forward. We can also provide you with a full set of plans stamped by a structural engineering for those jurisdictions that require structural calculations. Our years of installation experience combined with our fixed installation cost could be exactly what your business needs to concentrate on bringing in sales. When using Bright Life Solar as your installer you get a fully licensed, bonded and insured installation that includes all labor, balance of system costs and materials, inspections, monitoring system installation, warning signage, and a full 10 year installation warranty at no additional cost to you. You can eliminate the headache of dealing with an in house team and cut your hidden installation costs, so you can spend more time and energy on meeting with clients and closing deals. We can provide your business with a fully comprehensive site survey analysis that will allow you to bid on jobs accurately and confidently. Our site survey reps have extensive experience as installers, so they know first hand what will work and what won't, leaving you no doubt that your proposal will be professional and precise. Do you have your own designer? We ensure that our surveys are thorough and organized so they may be passed on to your designer with ease. Our permit technicians are well equipped with the technical knowledge that building officials look for, as well as the people skills that are needed to handle the permitting process. We are very familiar with jurisdictions all over southern California, and our reps have built a rapport with the city officials to ensure a quick turnaround time. We pride ourselves in minimizing trips to the city halls, and focus on turning around permits as quickly as possible.